The Quest stainless steel sports water bottle offers a wide-mouth opening which allows for easy filling and pouring and the slim shape fits in most vehicle cup holders. 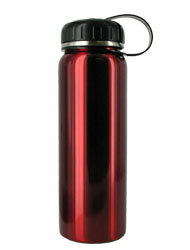 The cap is easy to grip and seals tight to prevent leaks. The water bottle features BPA-free polypropylene on the outside and food-grade stainless steel on the inside so your water does not come into contact with plastic.